BURN IT ALL, the new band featuring FEAR FACTORY members Christian Olde Wolbers (guitar) and Raymond Herrera (drums) alongside former DAMAGEPLAN singer/HALFORD guitarist Patrick Lachman, has posted a demo sampler on its MySpace page. The sampler includes audio clips of three recently demoed tracks "Disciple", "Spiral Fracture" and "Godless". 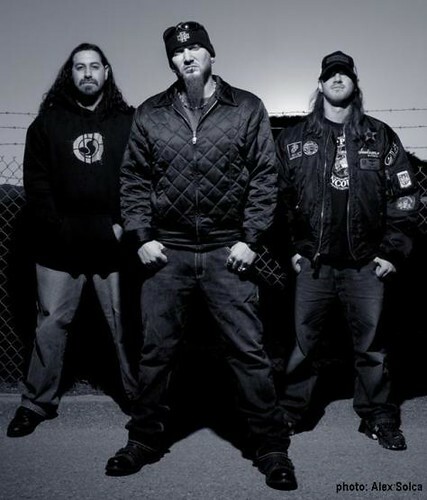 FEAR FACTORY is on hiatus while the band's frontman, Burton C. Bell, focuses his attention on the ASCENSION OF THE WATCHERS project, which recently inked a deal with MINISTRY mainman Al Jourgensen's 13th Planet Records. FEAR FACTORY is presently unsigned, having parted ways with Liquid 8 Records, the label that issued the group's last two albums 2004's "Archetype" and 2005's "Transgression". Christian Olde Wolbers and Raymond Herrera recently joined forces with THREAT SIGNAL vocalist Jon Howard in a new group called ARKAEA. The band's as-yet-untitled debut is due this fall on Koch Records.